Alexander Duarte has never gone to a school dance with a date. 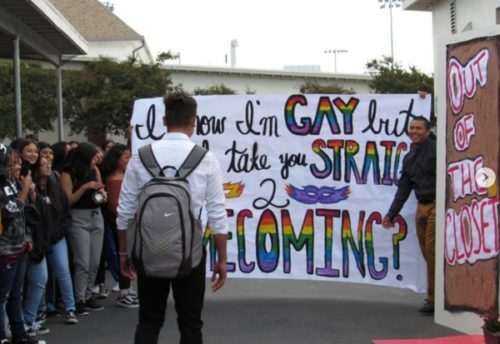 But after the gay teen asked his friend, football captain Erick Pineda, to homecoming on National Coming Out Day, that’s about to change. With Christina Perri’s “A Thousand Years” playing, Duarte burst out of the closet to ask the big question. “It all started as a joke. One day he said to me, Yo, take me to homecoming!’ so I knew that if I did it I would have to set the bar and be extra,” Duarte told the magazine. Duarte says that he and friends worked on the proposal for three weeks to prepare and spent 20 minutes just setting up the big event that day. Watch it below and try not to smile from ear to ear.